This shop featuring our DIY XL Checkerboard and Checkers game and lowest priced unlimited plans has been compensated by Collective Bias, Inc. and Walmart Family Mobile. All opinions are mine alone. Do your kids love board games as much as mine do? If so, I have a super simple craft that will add up to tons of fun for the entire family! I've become a bit of a nap-time crafter over the last year. Meaning, if I can't get it done in 1-2 nap-times, I don't attempt it. This DIY XL Checkerboard and Checkers project was fairly easy to put together, and only took me about an hour (excluding drying time) to complete. My older two children love to play with it out in our backyard after dinner, and I love that they're spending screen-free quality time interacting with each other. Start by using your low-temp glue gun and glue sticks to glue the lid inside of the canning rings. Next, paint 12 completed lids red and 12 black. Allow adequate time for drying and paint them with a second coat of paint. Allow adequate time for drying. Now, start your checkerboard. Create a 3"x 3" square template with your cardboard. With your pencil, trace the outline of your template, creating 8 rows of 8 squares across. Your completed checkerboard should have 64 squares in total. Cut around the outline of your checkerboard (leaving 2 1/2" of excess for your last step). Lay your checkerboard on top of the scrap half of canvas tarp. Paint your checkerboard squares (alternating black / light unpainted squares - refer to image above for exact configuration). Allow adequate time for drying. To complete your checkerboard, use Liquid Stitch to create a neat hem on the perimeter of your board. Note: make sure your fold / iron your seam on the underside of your board. Optional: decorate optional burlap drawstring bags to store your black and red checkers (pictured above). 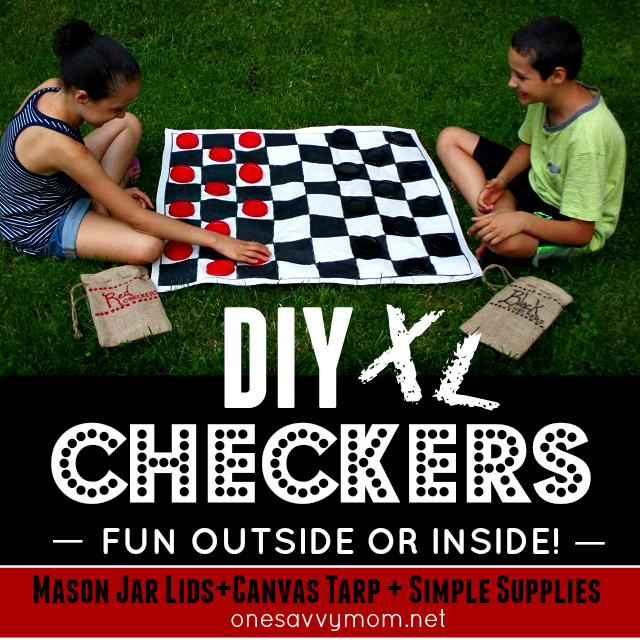 Have fun using your completed DIY XL Checkerboard and Checkers! I'm so excited to finally have completed this project after thinking about it for the past year or so! It was a little easier on my wallet too, now that we have extra money to play with each month. Which is all thanks to our recent switch to Walmart Family Mobile. We started by changing over one of our lines. Then, after experiencing the benefits and savings that Walmart Family Mobile offers, we switched our second line over last week. Our savings will be put to good use this summer. By saving on our cell phone service, we'll have more room in our budget for what matters most; making amazing summer memories with our kids! In our house, that means more ice cream sundae bars after dinner, more time to gather around our new fire pit for smores', and more fun DIY projects, like this DIY XL Checkerboard and Checkers set! When making the switch, I opted for the LG Leon. At just $99.99, it offers up the features that I'm looking at an affordable price point. 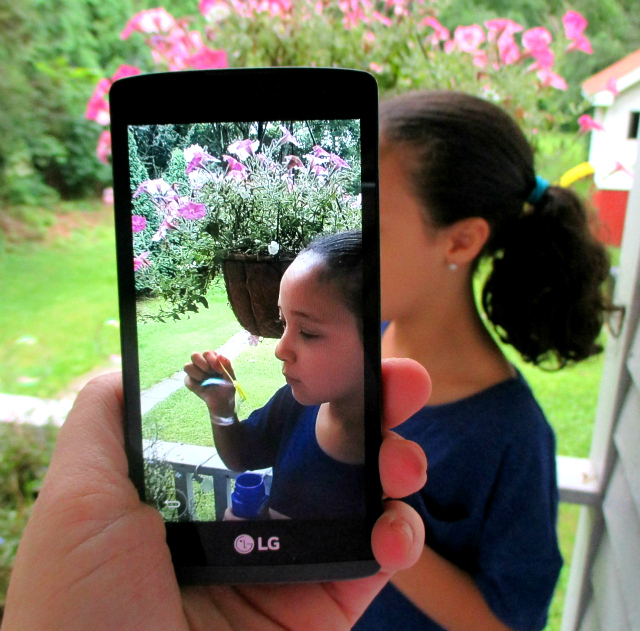 It also helps me capture great images of my kids, and all of the fun that they're having this summer! Did you know that Walmart Family Mobile is just $29.88/month (for the first line), and includes an Unlimited Talk, Text & Data service plan, which includes up to 1G of 4G LTE data? This adds up to $40 in savings every month for our family! 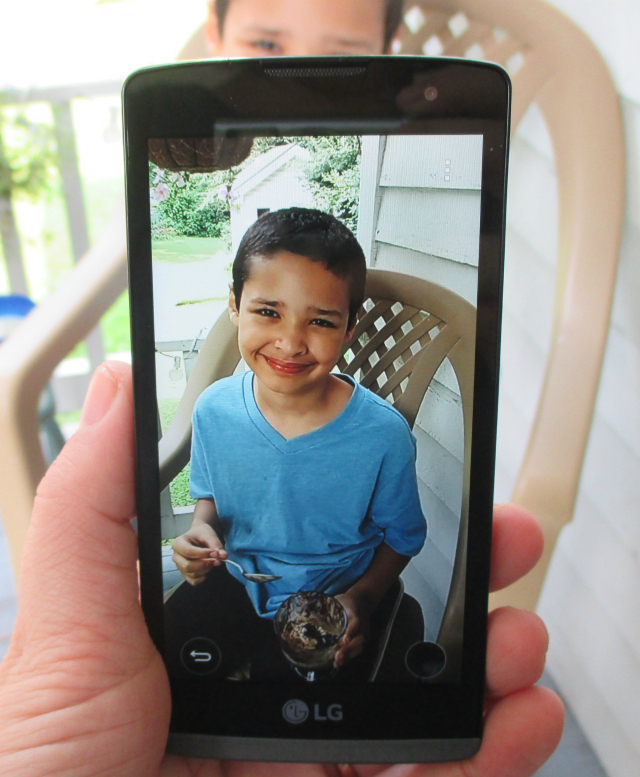 Getting started with Walmart Family Mobile is as easy as it gets! 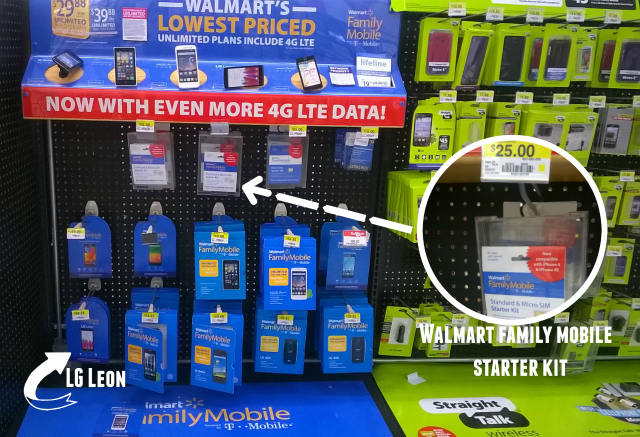 Simply choose your phone, and a pickup a Walmart Family Mobile Starter Kit. They can activate your line in-store at the register, or you can set up your service at home online. I opted to setup service online and it only took me about 10 minutes to activate my line from home. The perfect time-saving option for a busy mom of 3! What are your favorite ways to save and have fun with your children during the summer months? Share in a comment below! Disclaimer: All prices for phones and plans included in this post are accurate as of the date of posting; however, these prices are subject to change. Please refer to www.walmart.com or your local Walmart for current pricing. What a fun DIY for the family. We all love playing checkers, so this would be a family favorite for us, great for the outdoors! I see these sets online but why buy it when you can make it yourself! And i love the burlap gift bags to put the checkers in. What a fun and neat idea! I love checkers but haven't played it in years. The kids would love this. I love this idea. This is a great way for kids to unplug, get outdoors and have some good "old time" fun. Thanks! :) It is definitely a great way to break them away from all of the screen time! My grandkids and I go to the park. to the beach at the river, have signed up for free summer bowling at our local bowling alley and participate in a summer reading program at the library. 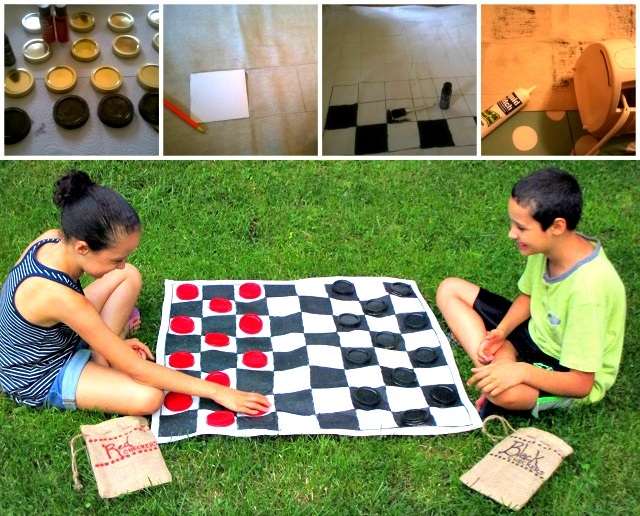 What a really fun craft checkerboard set to make and play outside in the summer. I like to make this and have my niece and nephew play it out back. Yours sure turned out great! What a great checkerboard game. It's really great to have extra spending money for crafts by saving money on your phone plan!